If you’re a little shrub, and you thought you didn’t need to worry about apex predators… thought the vertebrate carnivore was in your area wasn’t important to your establishment and survival… Well you need to think again. I hear you over there saying it’s no big deal. The fact is shrubs are kicking goals! Heaps of historically grassy areas have become increasingly woodier. Shrubs are dominating grasses and seriously changing the structure of ecosystems. Your establishment and survival is sorted you say? But why is this shrub encroachment such a serious problem now…? Maybe it has something to do with apex predators. That’s what investigator Chris and his team thought… so they went out to the desert where a predator-exclusion fence offers an opportunity to test this idea. 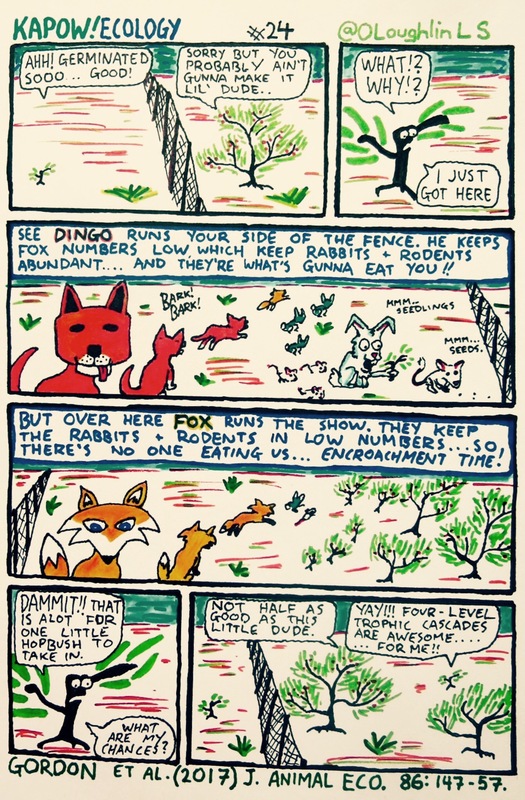 On one side of the fence, dingoes are the apex predator… they suppress foxes … and smaller herbivores are in good numbers. On the other side, no dingoes, so the mesopredator fox has been released and smaller herbivores are less abundant. Does the encroaching shrub (hopbush, Dodonaea) respond to this change? You bet! Where dingoes were rare, shrub cover was 50% higher, seedling survival was twice as high, and seed removal was twice as low. These patterns were directly driven by low rabbit and rodent numbers, that were directly driven by high fox numbers, that were directly driven by low dingo numbers. That is a four-level trophic cascade!! The take home message is that dingoes have a significant indirect top-down influence on suppressing the overabundance of a native shrub… So yeah, you gotta worry about the apex predator little shrub. For the actual science of this story, you should definitely read the paper and contact the authors if you have any questions. Gordon CE, Eldridge DJ, Ripple WJ, Crowther MS, Moore BD & Letnic M (2017) Shrub encroachment is linked to extirpation of an apex predator. Journal of Animal Ecology 86: 147-157. That’s when you reintroduce native mesopredators such as quolls and devils to the picture. To control the smaller prey so certain plants can grows of course. Forgot to type this part.